Christopher Tolkien, JRRT's son and the caretaker of his literary legacy, retired from the Tolkien Estate in September. The estate promptly approached Amazon, Netflix, and HBO to make bids on Tolkien's creation. Amazon won, and has recently announced a new series to be set between the events of The Hobbit and Lord of the Rings. First, a little bit of background. Christopher Tolkien has only ever allowed two of his father's works to be licensed -- The Hobbit and the Lord of the Rings -- on the simple and rather understandable premise that these were the only two texts which were "finished." That is, the only two which JRRT published during his lifetime. Everything else -- many thousands of pages of stories set in Middle-earth before the end of the Third Age, including what we call The Silmarillion -- was not yet done. And if it's not done, then it's not for public consumption. Various license holders have gotten around this restriction by using the end matter from LotR, which includes a summary of the story of Aragorn and Arwen, historical notes on the evolution of Gondor and Rohan, the sinking of Numenor, and vague mentions of "the uttermost West" and the greater powers which dwell there. But we haven't gotten, for example, the story of Beren and Luthien as a free-standing independent film, video game, or TV show because the only references to these characters in LotR are pretty elusive, and using them as the protagonists of a film would be outside the license. This is probably a good time to note that Christopher Tolkien did not even want to publish the Silmarillion because, again, it was not done. What he wanted to do is the History of Middle-earth, the ten-volume collection of his father's unfinished drafts and manuscripts. In other words: publish what his father wrote, and don't change it or make any "fixes" to it in the name of readability. But his co-editor on the Silmarillion, who was none other than Guy Gavriel Kay, persuaded Christopher that they had enough material to make a book and they wouldn't be making anything more than very minor editorial changes to the manuscript. And that, my children, is why we have The Silmarillion at all. You should all thank Guy Kay, preferably by reading his amazing books. Start with Tigana, which forever changed the way I read fantasy fiction. We know more about Tolkien's writing process than almost any other author, thanks to the work of Christopher Tolkien. JRRT had a three stage process: first, he outlines the plot in a sort of bullet list (though he'd really resent that term). Then, he expands that into a narrative summary of the plot. There's some dialog here and there, but it's mostly exposition. This is what you've read in the Silmarillion or the "Tale of Aragorn and Arwen." But that's not a finished book. The third stage is expanding the exposition into an actual novel, and he only got that far with Hobbit and LotR. So if you have tried to read The Silmarillion and could not get into it: you're right! That was never intended for anyone but JRRT himself. You're reading his long notes on novels he never finished. No wonder you found it boring. With Christopher stepping down (he's 93! ), less conservative heads have prevailed and Middle-earth -- which was already a very lucrative IP -- is now even more lucrative. The Amazon show is only the first sign of what will be a wave of Tolkien-themed media. I can't predict how good it'll all be, and if the first releases aren't successful, the wave will probably crash. But I am optimistic about the upcoming Amazon show. For one thing, contrary to the way many outraged fans are describing it, it's not a do-over of Lord of the Rings. Instead, the series appears to be aimed at the decades-long period between Bilbo's return to the Shire at the end of The Hobbit (age 51) and his eleventy-first birthday party at the beginning of Lord of the Rings. This is an incredibly fertile ground for stories. These 60 years contain some amazing tales starring characters we already know and love, particularly Aragorn and Arwen. The romance between Aragorn, last heir of a ruined house, and the fairy-tale princess who loves him despite his poverty, rough appearance, and lack of any personal accomplishment, is the backbone of this period. Aragorn cannot marry Arwen without the approval of her father, who is thousands of years old and appropriately hard to impress. And so, after the two lovers pledge themselves to each other, Aragorn leaves and, in good Shakespearean fashion, adopts a disguise for himself. He serves the King of Rohan (meeting a young Theoden) and the Steward of Gondor (becoming a rival for a young Denethor). In the latter role, he leads a war against the city of Umbar, which has declared open allegiance to Sauron. Now showered with glory, he ditches all of it along with his disguise to once again be Aragorn and, returning to Elrond, he is judged to be maybe not so bad. And that's just the main plot. Buried in there is the dwarven expedition to Moria, perfectly suited to a one-season arc which brings back several familiar characters from The Hobbit, and doubtless introduces a bunch of new ones, only to kill off every single one of them in the season finale (spoilers for a book published 60+ years ago). Epic. This time period is so ripe for adventure that two tabletop RPGs have already been set in it: The One Ring RPG and it's D&D cousin, Adventures in Middle-earth. I've played both and they're great games, but the decision to use these decades was very smart -- one that many Middle-earth gamers have been using themselves in homebrew campaigns for decades. The late Middle Earth Role-Playing game was set in the year 1640 of the Third Age, when none of the famous characters were alive and Middle-earth had just been ravaged by a great plague. That's a good time if you're worried your players will feel overshadowed by Aragorn and the rest, but it's totally unnecessary. There's so much to do in Middle-earth, and Aragorn is only one guy. So yes, you're going to see a recasting of Gandalf, Aragorn, Legolas, Bilbo, Gimli and the rest. But you're not going to see the same story. And I look forward to recasting, because the more versions of Gandalf et al. there are out there, the less definitive Peter Jackson's versions become. This is not to say I hated the films; I quite enjoy most of the 12-hour Lord of the Rings extended run. But Tolkien wrote prose fiction for a reason: he was using your own imagination to bring to life characters whose physical appearance he himself had almost no interest in detailing. It mattered to Tolkien that Arwen had grey eyes and black hair, because his wife had grey eyes and black hair, but most of the time Tolkien doesn't seem to have been very interested in what these people looked like. I'd like to shake loose our pop culture conception of these characters and bring back some wiggle-room. 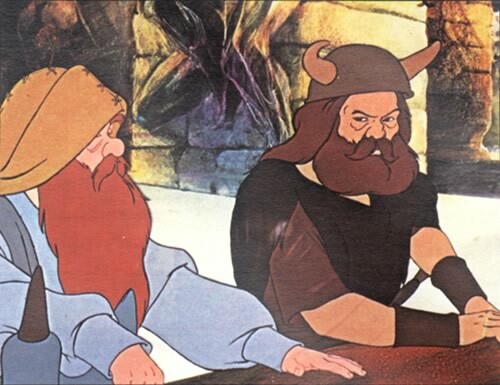 Like, for a while, Aragorn wore a swashbuckler hat and Boromir was cosplaying as a Viking. So I, for one, express cautious optimism, and I look forward to seeing much more of Middle-earth than was previously possible, as justified as Christopher Tolkien's position might have been.